Brand New Construction! Rare to market Contemporary Single Family Home with mahogany fenced in lush private yard, and parking. 4 well appointed bedrooms and 3 full baths. 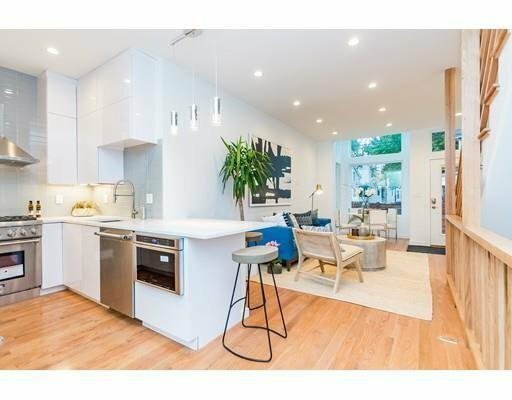 Sleek gourmet kitchen with Thermador/ Bosch appliances and elegant quartz countertops has breakfast bar opening to bright and airy dining & living space. Sliding glass doors to generously sized bluestone patio and private yard perfectly blends indoor/outdoor living. Tranquil tree-top master bedroom has en suite full bath, deck, and skyline city views. Lower level offers another great space to entertain, relax or host guests with a bar kitchen, 4th bedroom/office/guest room, full bath, and spacious family/media room that opens up to sunken patio with stairs to yard. This unique home combines practical living spaces with amazing design detail. Superbly located between Kendall and Central squares, a short distance to MIT, the Charles river as well as popular restaurants and cafe's.